The most endearing quality of these top-rated outdoor bars goes beyond the twinkle of string lights and the novelty of a hammock garden. It lies in the fact that Philly's al fresco season is fleeting. In just a few months' time, temperate breezes give way to blustery autumnal winds, and heat lamps don't quite hold the same charm as candlelight, do they? Translation: Get to these outdoor spots while Mother Nature allows. Young professionals congregate at this swanky bar and restaurant, perched 11 stories above ​the ground at the trendy Hotel Monaco. Here, flames from a linear fire feature lick the summer air behind an upholstered banquette, while ambient colored lights cast an atmospheric glow upon martini-fueled evenings. Interspersed with s'more-friendly fire pits, rows of picnic tables beckon to imbibers within the gravel courtyard at this contemporary "biergarten," which is open year-round. Bartenders fill steins with German brews from behind multiple bars, so the wait for a Hofbräu or a Köstritzer is rarely ever long, while wiener schnitzel and giant soft pretzels provide sustenance to the after-hours crowd. A 3,000-square-foot beer garden adds yet another role to the multi-tasking nightclub, retro diner, and cocktail lounge otherwise known as Silk City. When it opens in the spring, the beer garden is a scenic spot for sipping sangria under the criss-cross of string lights. Return in the morning for Silk City's oft-raved-about brunch. 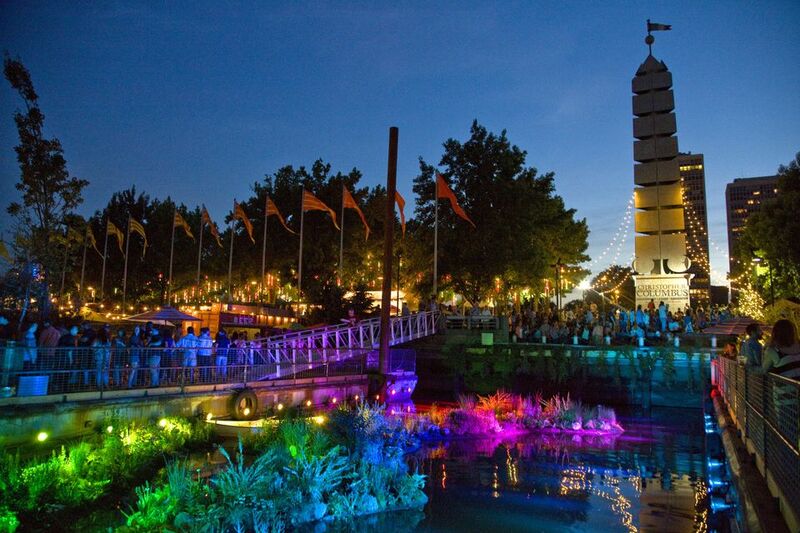 The jewel in the crown of Philly's seasonal bars, Spruce Street Harbor Park transforms a stretch of the Delaware River waterfront into an urban "beach" every summer. Instead of sand, however, visitors are greeted by a hammock garden, a boardwalk made from repurposed shipping containers, and pay-as-you-go concessions that span tacos to craft beer. Once the sun sets, a canopy of color-changing LED lights imparts an other-worldly glow upon the beloved outdoor space. Located right on the Delaware River and able to seat 500 people, the seasonal Morgan's Pier works overtime as a restaurant, beer garden and entertainment venue (think DJs and live music). Don't depart without trying the bar's popular Watermelon Rickey and snapping a selfie with the Benjamin Franklin Bridge. A tangle of English ivy and string lights scales the walls within the verdant courtyard at Talula's Garden, a charming farm-to-table eatery just off Washington Square Park. Back on solid ground, seasonal blooms burst forth from a plenitude of planters, adding a pop of color to a space dominated by the umber tones of reclaimed wood. Pro tip: Arrive post-sundown, and have your pinot gris and cheese board at the garden bar.